The purchases included four new full-size coaches — all Prevost H3-45s — that can each carry up to 56 passengers. 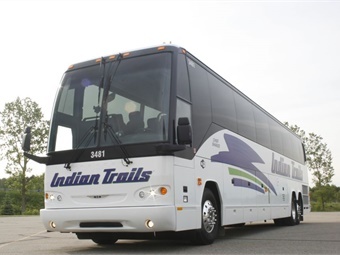 Owosso, Mich.’s Indian Trails Inc. invested more than $3 million in eight new motorcoaches for the ongoing comfort and safety of its charter groups. 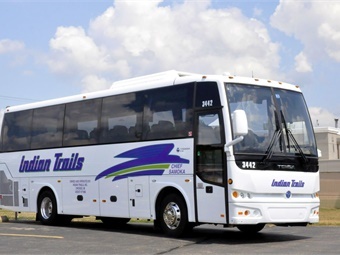 Indian Trails’ motorcoaches are chartered by professional and college sports teams, corporations, universities, trade associations, churches, and other groups in Michigan, Ohio, and Indiana for trips to whatever destinations they choose in the Continental U.S. or Canada. The purchases included four new full-size coaches — all Prevost H3-45s — that can each carry up to 56 passengers. The deluxe vehicles exceed EPA standards with engine technology that reduces exhaust pollutants to near zero while achieving 240 passenger miles per gallon. Also included were four new mid-size buses, built by Temsa, each with 34 passenger seating capacity. Also included were four new mid-size buses, built by Temsa, each with 34 passenger seating capacity. These coaches, too, are environmentally friendly and fuel-efficient, with a range of 760 miles on a single tank of fuel. The coaches all have comfort features comparable to a commercial airline’s business class — reclining seats with ample leg room, headrests and footrests, individual overhead climate controls and reading lamps, outlets for charging mobile devices, free Wi-Fi internet access, a DVD player with flat-screen HD color monitors and a premium sound system, an on-board lavatory, overhead storage racks, and ample storage for luggage below deck. Safety features include antilock brakes, automatic traction control to aid drivers and protect passengers in poor weather conditions, GPS tracking, three-point seatbelts for each passenger, an engine fire-suppression system, and a front-kneeling suspension that lowers the coach to help passengers get on or off. The company’s mid-size coaches are especially in demand among college athletic departments with teams in sports like lacrosse and track and field who need to transport smaller groups, he says. And features such as free Wi-Fi are important to student athletes who need to study while traveling. Also, tour operators who may not be able to fill a large coach to capacity for trips to certain destinations find the mid-size coaches desirable, Cushman added, because smaller coaches offer operational cost-savings that can be passed along to their tourist clientele.